Frank Vans Agnew left America in 1914 and claiming to be 40 (rather than 46) enlisted in 2nd King Edward's Horse. He arrived in France in 1915 at Festubert and was given a commission. 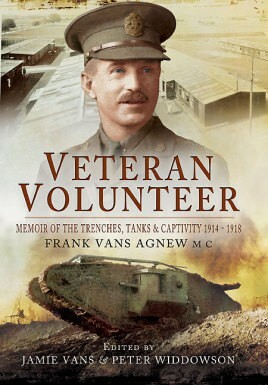 After attending the Machine Gun School he was at the Somme before volunteering for the Tank Corps. In 1917 he was wounded at Messines, where he won his MC. He demonstrated his tank for King George. He fought at 3rd Ypres and was wounded and captured at Cambrai in November 1917. Over the next 12 months he was held as a POW at Hanover, Karlsruhe, Heidelberg and Füstenberg. His extraordinary and varied experiences are superbly recorded in this memoir. As featured in Isle of Wight County Press and on BBC Radio Bristol.